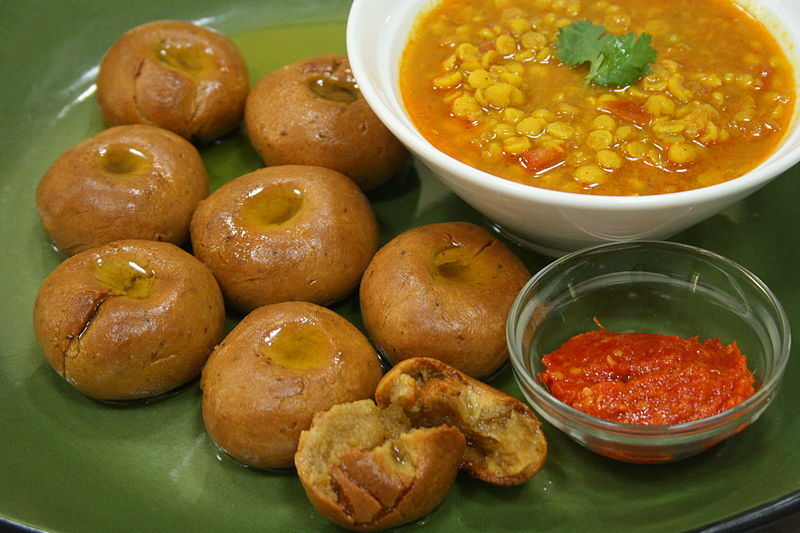 Dal bati is a traditional delicacy originated in Rajasthan-India and is very popular throughout northern India. This is a must make recipe during rainy season in traditional manner. This mouth watering cuisine is a complete meal in itself and is generally served as a brunch item on special occasions. Boil both lentils separately along with salt and turmeric powder in pressure cooker until they become soft and tender. Put a deep pan on medium heat with ghee in it. Add cumin seeds and chopped ginger, saute for a minute and then put in all spices except cumin powder. Pour in both cooked lentils into the pan, stir fry for a minute and then turn off the heat. Add roasted cumin seeds powder, chat masala, chopped green chilies and green coriander leaves. Cover the pan and let it stand until serving time. Take whole wheat flour in a bowl or on a platter, add salt, curd and 1 tablespoon ghee. Knead into soft dough by adding required water. Cover it with a damp cloth and keep aside for 20 to 30 minutes. Take small portions of dough and roll them to lemon sized dumplings. Keep them covered and let rest for 10 minutes. Roast all dumplings over a barbeque grill or a gas tandoor from all sides until they turn golden brown. Dip hot roasted wheat dumplings in melted ghee and transfer to a serving plate immediately. Serve hot batis with hot dal. Tip: Batis may also be baked in the oven at maximum temperature.